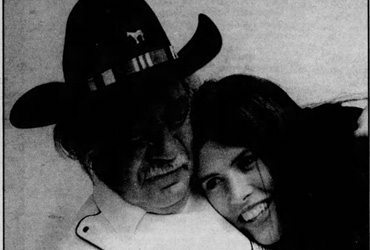 Club owner, singer and sometime Giant Sand member Pappy Allen, who died last month, with singer Victoria Williams. Editor’s note: Claude “Pappy” Allen died of a heart attack at midnight on Feb. 28, in transit from his home of Pioneertown, in the Mojave Desert of California, to the hospital in Palm Springs. He was 77. A nightclub owner, contractor, country singer and all-around good guy, Allen also was a sometime member of the Tucson band Giant Sand, with whom he appeared in Tucson on several occasions. He is survived by his wife, Harriet; daughters Cheryl and Carla; a son, Jack; and numbers grandchildren. The following is a tribute to Allen, written by Giant Sand leader Howe Gelb, who lived for a while in Pioneertown. He would mention something about a wall that wasn’t there, and the next morning you would get up way too early and find yourself building that wall with him. And I think “find yourself” is accurate in every way. The day would pass long and hard under the broiling sun, and you would realize every hour or so you were still smiling. Harriet would cook up something way too good, and you were a vegetarian who would eat meat with him. It was OK. Sometime later, in the late afternoon scorch, we would head to the swimmin’ hole hidden up on the back way to Big Bear. I would stand up and surf in the back of the pickup while Pappy, then 72, and Johnny Edwards, 50, would barrel up the non-roads through the foothills to Lonnie’s gold-mine camp. Pappy knew how to have fun. The new, bigger, better restroom wall was done and looked like it had been standing a hundred years. He was a master human being. Pioneertown is the kind of desert town that doesn’t really exist, except in dreams. Somehow it got spliced into real time. It was originally built up as an authentic Old West town in the ’40s for Tom Mix-type Westerns. Unlike Old Tucson, it has become an actual community with its wide dirt road, “Mane” Street, Joshua Tree scatterings and a six-lane bowling alley. And, of course, Pappy and Harriet’s Pioneertown Palace nightclub, the center of the universe for leathery souls lost and found. When you move there, your days come complete with a crooked smile attached. Strange things happen all the time there. And when they don’t it’s just not normal. Good and evil spend their spare time there, and Pappy kept it all in balance. He was a master human being. One day I found myself helping him finish putting in the shiny new urinal. Still smiling, Steve Wynn was playing at McCabe’s, way down the road in L.A., and had invited me to do a song with him and his band that night. But why leave heaven for that hell? “Pappy, do you wanna sing in Hollywood tonight?” I find myself asking. “Sure, we can do that,” he answers, with a melody. We clean up. We go. I teach him “Loving Cup” on the way there, but it’s a two-hour drive and only a three-minute song. Pappy climbs in the back of the ’66 ‘Cuda and naps under the long, sloping glass shelling him from the freeway stars above. Pappy gets up at 5 every morning. We get to McCabe’s late and right on time. Steve is looking a little perplexed at me. We meet Victoria Williams, but Geoff Travis from Rough Trade Records soon whisks her out of there before we get to sing. Geoff has heard Giant Sand as a two-piece and didn’t quite get the vision. Six months later, he is eager to release in Europe our album “Ramp,” which includes Pappy and Victoria with us for the first time. We end up touring Europe altogether, which was all Harriets’s idea, fueled by the fact that no one in Pi-Town really believed we’d take Pappy. He conquered Europe and still got up at 5 every morning. It was like the Giant Carnival and Rolling Thunder Sand Revue. Whatever. Pappy and I sang for the first time in public that night at McCabe’s. We each hand-held a mic and alternated verses exactly like Sonny and Cher. Johnette (Concrete Blond) Napolitano’s mom fell in love with him. Our job done, we headed back to the hills. 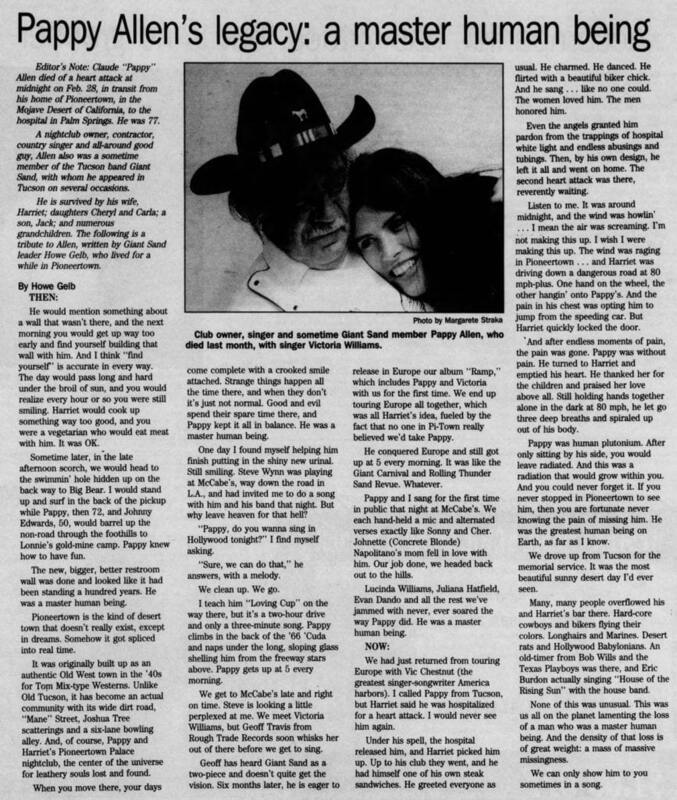 Lucinda Williams, Juliana Hatfield, Evan Dando and the rest we’ve jammed with never, ever soared the way Pappy did. He was a master human being. We had just returned from touring Europe with Vic Chestnut (the greatest singer-songwriter America harbors). I called Pappy from Tucson, but Harriet said he was hospitalized for a heart attack. I would never see him again. Under his spell, the hospital released him, and Harriet picked him up. Up to his club they went, and he had himself one of his own steak sandwiches. He greeted everyone as usual. He charmed. He danced. He flirted with a beautiful biker chick. And he sang . . . like no one could. The women loved him. The men honored him. Even the angels granted him pardon from the trappings of hospital white light and endless abusings and tubings. Then, by his own design, he left it all and went on home. The second heart attack was there, reverently waiting. Listen to me. It was around midnight, and the wind was howlin’ . . . I mean the air was screaming. I’m not making this up. I wish I were making this up. The wind was raging in Pioneertown . . . and Harriet was driving down a dangerous road at 80 mph-plus. One hand on the wheel, the other hangin’ onto Pappy’s. And the pain in his chest was opting him to jump from the speeding car. But Harriet quickly locked the door. And after endless moments of pain, the pain was gone. Pappy was without pain. He turned to Harriet and emptied his heart. He thanked her for the children and praised her love above all. Still holding hands together alone in the dark at 80 mph, he let go three deep breaths and spiraled up out of his body. Pappy was human plutonium. After only sitting by his side, you would leave radiated. And this was a radiation that would grow within you. And you could never forget it. If you never stopped in Pioneertown to see him, then you are fortunate never knowing the pain of missing him. He was the greatest human being on the Earth, as far as I know. We drove up from Tucson for the memorial service. It was the most beautiful sunny desert day I’d ever seen. Many, many people overflowed his and Harriet’s bar there. Hard-core cowboys and bikers flying their colors. Longhairs and Marines. Desert rats and Hollywood Babylonians. An old-timer from Bob Wills and the Texas Playboys were there, and Eric Burdon actually singing “House of the Rising Sun’ with the house band. None of this was unusual. This was us all on the planet lamenting the loss of a man who was a master human being. And the density of that loss is of great weight: a mass of massive missingness. We can only show him to you sometimes in a song.